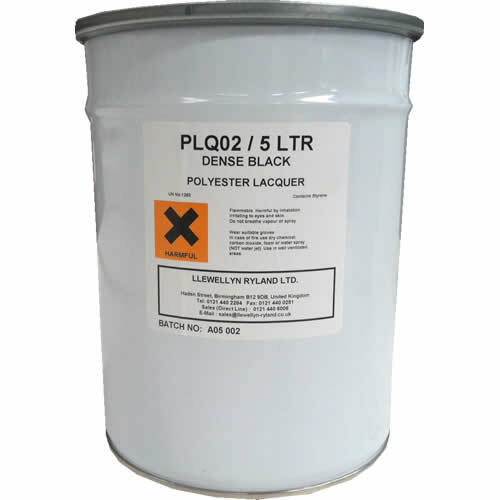 PLQ02 polyester lacquer has been developed as a finishing coat for the manufacture of plugs and production tools. PLQ02 can be applied to multiple surfaces including Marine ply, MDF board, polyester topcoat or ideally, Llewellyn Ryland PLQ04 or PLOD5 polyester primers. Care must be taken to ensure any surface to which PLQ02 is to be applied has been correctly abraded, cleaned and is free from dust and dirt. llewellyn Ryland recommends the customer carry out a small trial with PLQ02 and the required substrate to check for compatibility and suitability. PLQ02 is supplied in a state that requires the addition of 2% medium reactive MEKP (M50) to be ready for spraying through a gravity feed or pressure pot paint spray gun with 1·8mm 2.5mm nozzle. Additional solvent should not be required. However; if necessary a viscosity adjustment can be achieved with the addition of a small amount of Ethyl Acetate or Methyl Ethyl Ketone.